Well, this is my first post back on Strikerless after a long absence running my own blog The Tactical Annals. First things first, thank you very much to Guido for having me back on the site, and it’s fantastic to be writing here again. All of the old articles I wrote on this website are still available, so if you have no idea who I am, or you haven’t read any of my articles before, then go check them out! So, my first article back is going to be tactically focused and – sorry Guido – it features strikers. Only one though. I’ve been developing it with Santos since they have an abundance of players able to play in several positions, and as any of you who follow me on Twitter (@JLAspey) will have seen, it’s been working pretty well. The tactic was inspired by a few articles I’ve seen recently around the FM scene. The first article was from the SI Tactics forum and focused on ultra defensive football. What really caught my attention, however, was the use of an Inverted Wing Back accompanying a Back 3 to link the play to the central midfielders. This linkup was a theory I’d never seen applied before and wanted to try it out for myself. I also read this article, which aimed to use asymmetric tactics to draw the AI over to one side to exploit space. I intended to combine both these theories into creating a tactic that utilised overloads through an IWB, to unleash an isolation player on the other flank. Here is the system that I set up to demonstrate this specific philosophy. It’s effectively a 3-5-2 with the second striker offset to the left flank as an out and out winger. I’ll discuss why I’ve done that later, but first off the Back 3 consists of two standard CD-D’s flanking a BPD on cover duty. It may seem odd to include a Ball Playing Defender just behind a DLP, but I only just want to encourage as many players as possible – especially those capable – to make the passes that really do unleash this system. Again, more on that later. The next line features a DLP-D, an IWB and a WB-A. This line is where things get interesting. The WB-A is the ‘isolation’ player, designed to get up and support the forwards from Wing Back, and basically act as a winger that starts deeper and joins the play as it has developed. The IWB is designed to come inside and join midfield and create a massive overload in the centre of the park, with a CM-A and a BWM-S also working together to work the ball through the centre of the park. With all this movement and attacking movement from the flanks, I’ve gone for a DLP-D to sit deep and cover, and provide a consistent out ball to recycle possession. There’s also a pleasant side effect of this decision as well that I’ll describe later. The width on the left side is provided by a W-A, an out and out winger whose job is simply to attack and run at defenders before crossing or shooting. This winger works directly in combination with the IWB, with both roles dragging defenders in totally different directions. The W-A’s wide positioning also creates space for the CM-A to attack into, with defenders forced to keep an eye on the winger. Upfront is an AF to stretch the defensive backline, create space for the attacking midfielders to move into, and get on the end of crosses from our ultra attacking wide players. Here are the mentality, shape and instructions I use for this tactic as well. The mentality took some experimentation to get right, as I switched between ‘standard’ with a high line, and ‘control’. In the end, the system worked better with the higher tempo and increased attacking mentality provided by control, so it’s stayed, along with some basic instructions to play out, work the ball into the box, and look for the overlap. Look for overlap was particularly added after hearing Guido’s chat with Rashidi from Bust The Net, and how Guido used this shout to make things easier for his own wing backs. Now let’s begin to look at how this tactic performs when going forward, as this is the entire basis of the tactic, relying on the interplay and movement between the key roles, particularly the IWB and the W-A. In the above screenshot, you can see why the IWB is so important to this system, and why it’s become one of my favourite roles in FM17. 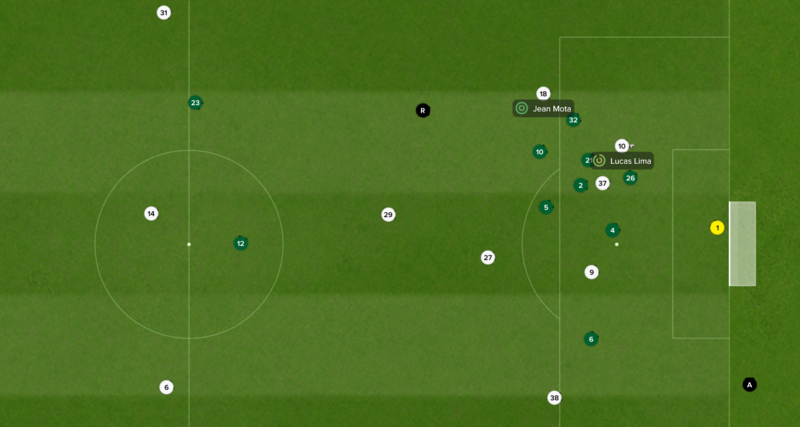 In this instance, the IWB has come in to join midfield and has formed an overload in the centre of the park. The opposition Number 7 is left with the option of closing down the IWB and leaving a pass open to our CM-A, or leaving the IWB to run into the box. In the end, he leaves the IWB, who drives into the yellow circle, and makes the pass to the AF. A simple layoff to the W-A ensues, and we score. This movement would not have been possible with a standard 3-5-2. The confusion that the IWB causes in collaboration with the W-A’s high and wide positioning is absolutely crucial to how this tactic works. It regularly results in a high number of shots inside the opposition box, showing that we create quality chances. Again, here is another example of the importance of the IWB. In this instance, we’re attacking, and we’ve formed a 3-4-3 diamond shape as we attack, something that is a regular feature of this tactic – Johan Cruyff eat your heart out – with the IWB coming into central midfield. This intricate movement creates absolute havoc for the opposition box midfield, and especially for their right back, who has the choice of marking either the Winger or the IWB – either option leaves a massive gap – and in the end, he does neither. A fantastic crossfield pass in the red arrow from the BWM-S leaves the W-A attacking the byline, and he crosses for the AF to tap in. We’re also still strong defensively, as can be seen by our 4v3 at the back should we somehow be counter attacked. Just to demonstrate my claim that this regularly turns into a 3-4-3 diamond, here is our with ball positioning from a full match. As you can see, the Back 3 remains standard, but the CM-A moves up into a Pseudo-10 position, with the IWB coming inside as a shuttler in central midfield. The WB-A plays so high and attacking that he is basically another winger, and therefore we become a Cruyff-esque 3-4-3 diamond. This advanced positioning also illustrates the importance of keeping the DLP on a defend duty, because he has to cover a lot of space defensively, and we’d be in trouble without him. Discussing the defensive shape and capabilities of this tactic, here is an example. This is a screenshot from an extremely comfortable 4-0 win against Corinthians in the State Championship. Corinthians were playing with a narrow 4-3-3, a system that could potentially have threatened our back line and put the Back 3 under pressure. However, you can see here that as the ball is played into Guilherme, we have a solid 4v3 against their strikers – again showing the importance of the DLP-D – and our wing backs are in good solid defensive positions. We’re narrow and compact with the two yellow lines showing our most important defensive players. What’s more, you can also see in the blue circle the sheer amount of space that our winger has should we win the ball and be able to get it to him. This is a consistent threat, and we do score goals from simply being able to leave him there. It’s a very old-fashioned ploy of simply letting the winger stay upfield and not come back to defend, but our shape allows us to do that, safe in the knowledge we still have eight men back to defend. Earlier in this article, I talked about how the aim of the tactic was to cause overloads on the left side through movement and changes of positioning – Juego de posicion if you will – to exploit an isolation on the right side with the WB-A. Below is an example of how this works with this tactic. In this instance, we’ve recovered possession from a Palmeiras throw in, and play has been sucked over to the left side with our entire ‘diamond’ midfield in the teal rectangle area. Our CM-A – the creative Lucas Lima – ends up with the ball and can spot the isolation that we can exploit on the right flank as our WB-A is in a potential one on one with the opposition left back. Lima then quickly makes the pass in blue, and our WB-A has this opportunity. Unfortunately, he can’t make the most of it, but he works the ball back over to the IWB, and some lovely interplay between the IWB, W-A (Mota) and Lima leaves Lima in on goal, with the keeper making a very good save. It didn’t end up coming off, but this idea of overloads leading to isolation is crucial to this tactic’s success. The opposition had to scramble over to cover this one on one, and it left spaces for us to exploit back on the left side. Here’s another excellent example of this isolation play against Palmeiras. Palmeiras are playing a box midfield, and as you can see they’ve been sucked into the yellow circle as they try to cope with our midfield movement, with their RB unable to help as he has to mark our winger. The ball then finds itself recycled back to our DLP-D, and as he does quite often, he plays the long range pass to the WB-A, who can attack the acres of space vacated by the left back helping out his midfield. Our wing back ends up hitting the byline and crossing for the AF, who forces a good save from Palmeiras’ keeper. Again, this shows how attracting the AI over to one side of the pitch, and then unleashing hell on the other side can be very effective. This is a style of play that Pep Guardiola mastered with his use of Douglas Costa in his final year with Bayern. This tactic is still a developing one, but it’s one that I feel has massive potential, using a range of movement that the opposition AI struggles to deal with. The ball is moved quickly, and both flanks of the system cause absolute havoc. The above shows how dangerous the tactic can be when going forward, and how it reverts to a solid and compact 3-5-2(ish) shape when defending. Since I’ve moved to this system, we’ve done nothing but score goals at a fantastic rate, and as you have seen in the above images, the system is also excellent in defence. Above you can see the scores from each game with this system, and it shows how well we’ve played, scoring 17 goals and conceding only 1. It’s a system that I fully intend to continue using moving forward. Some of the football it plays can be so fluid, and it’s fantastic to watch the movement of the key roles. 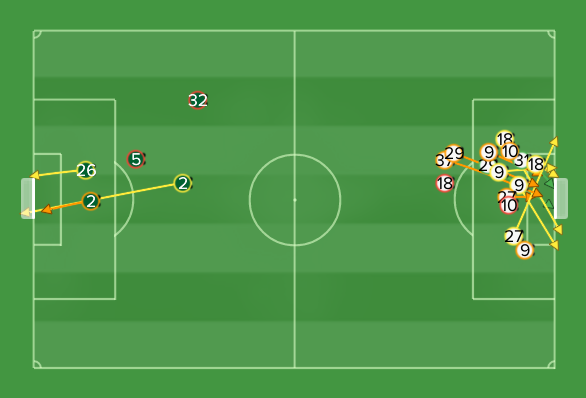 I don’t know if I’ll end up blogging about this Santos save, but I fully intend to continue developing this system. Should I make any improvements or tweaks, I may write about it again. However, until then thank you very much for reading and thank you again to Guido for welcoming me back to this blog. Should you have any questions, please feel free to ask in the comments section of this article, or contact me on Twitter (@JLAspey). Thank you again for reading. A 24 year old aspiring football writer with a keen passion for football in Eastern Europe, and its relationship with politics. Particularly interested in the effect of Communism on football in the region, and the results of its collapse. Lover of Back 3's, Italian football and classic Number 10's. I also write about the Football Manager series of PC games on my own blog, The Tactical Annals. I am available on Twitter (@JLAspey). Nice piece.. how do the team instructions look? I’ve actually been using a similar system to this with my Atletico Madrid save. I just use a Raumdeuter (Griezmann) and a center mid on defend with tackle harder instead of a ball winning midfielder. can we download the tactic?? Will keep an eye on this, would like to see/try the built on version once its available. Have you shared this tactic on Steam? I’ve never shared anything on stream (largely though not knowing how), but I might look at it. Great, I need them player instructions.